Glycine is a major inhibitory neurotransmitter in the mammalian central nervous system (CNS). Its receptors, the inhibitory glycine receptors (GlyRs), are ligand-gated chloride channels composed of ligand-binding α and β subunits (Betz and Laube, 2006; Lynch, 2009). In mature neurons, the activation of GlyRs allows for an influx of chloride ions into the cytoplasm, which hyperpolarizes the postsynaptic membrane and, thereby, reduces neuronal firing. Inversely, the blockade of GlyRs by the competitive antagonist strychnine causes overexcitation resulting in pain, muscle cramps and exaggerated startle responses (Harvey et al., 2008). Apart from its major transmitter function in spinal cord and brainstem, glycine also mediates substantial inhibitory neurotransmission via glycinergic amacrine cells in the mammalian retina. Thus, the abundant and highly complex expression patterns of different GlyR subtypes in the inner plexiform layer create an appealing field of retinal research. The GlyR was the first neurotransmitter receptor protein to be isolated from the mammalian CNS. Purification of the GlyR from rat spinal cord by strychnine affinity chromatography revealed three distinct polypeptides of molecular mass 48, 58 and 98 kDa (Pfeiffer et al., 1982). The 48 and 58 kDa peptides were shown to correspond to the α1 and β subunits, respectively. The 98 kDa peptide was later identified as the cytoplasmic protein, gephyrin, which is essential for clustering GlyRs at postsynaptic densities via direct interactions between the GlyR β subunit and intracellular microtubules (Meyer et al 1995). GlyRs are pentameric ligand-gated ion channel receptors of the Cys-loop family, which also include GABAA/C receptors, muscle and neuronal nicotinic acetylcholine receptors, and serotonin type 3 receptors. Members of this superfamily share a common proposed structure (Figure 1). Each subunit consists of a large N-terminal extracellular domain, four transmembrane segments (TM1–TM4), a long intracellular loop connecting TM3 and TM4, and a short extracellular C-terminus. The second transmembrane segment, TM2, lines the inner ion pore which, in GlyRs and GABAA/C receptors, displays strict anion selectivity. Molecular cloning has revealed four genes encoding the α subunits (α1, α2, α3, α4) and only one gene encoding the β subunit (Matzenbach et al. 1994; Harvey et al., 2000). In the adult organism, two copies of the α subunit and three copies of the β subunit form the pentameric receptor protein (Grudzinska et al., 2005). Figure 1: Structure of ligand-gated ion channels A) Each GlyR subunit consists of a large N-terminal extracellular domain, four transmembrane segments (TM1–TM4), a long intracellular loop connecting TM3 and TM4, and a short extracellular C-terminus. B) Proposed structure of a ligand-gated ion channel. TM2 forms the lining of the ion pore. C) Glycine receptors are pentamers constructed from α and β subunits in a ratio of 2α:3β (from Moos and Smart, 2001). In the retina, approximately half of the amacrine cells release glycine at their synapses with bipolar, other amacrine, and ganglion cells. Glycinergic amacrine cells can be immunolabeled with antibodies against glycine or against the glycine transporter GlyT1 (Menger et al., 1998; Pow, 1998; Pow and Hendrickson, 1999). 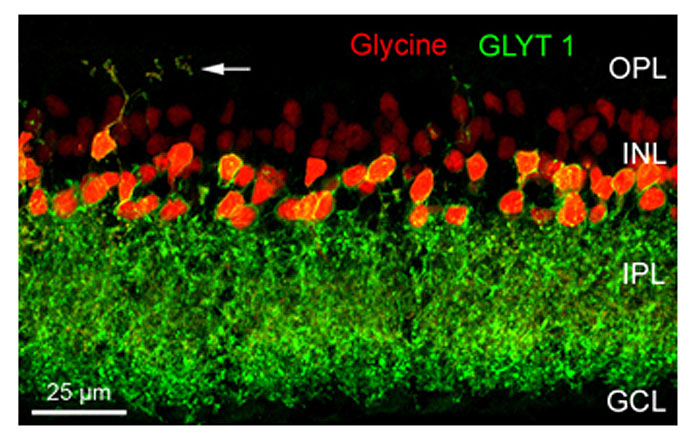 Figure 2 shows a vertical section through a mouse retina that was double immunolabeled for glycine and for GlyT1 (Haverkamp and Wässle, 2000). Strong glycine immunoreactivity can be observed in amacrine cell bodies and their dendrites descending into the inner plexiform layer (IPL) or in dendrites from interplexiform amacrine cells ascending into the outer plexiform layer (OPL). Weak glycine expression is also found in putative ON-cone bipolar cells in the outer half of the inner nuclear layer (INL). The section was also immunolabeled for GlyT1 which labels all glycinergic amacrine cells but not bipolar cells. Bipolar cells do not express GlyT1 but they receive glycine by diffusion through electrical synapses (gap junctions) from glycinergic amacrine cells (Vaney et al., 1998). 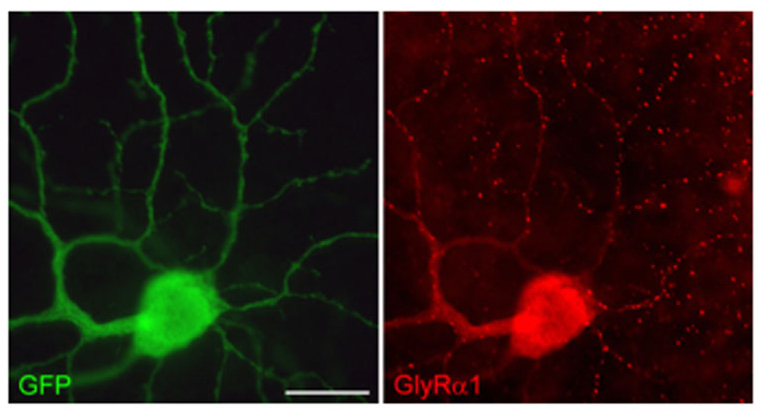 In other parts of the CNS, GlyT1 has been localized to glial cells, while GlyT2 is now known to represent the presynaptic neuronal glycine transporter. Surprisingly, GlyT2 does not appear to be expressed in the mammalian retina (Zafra et al., 1995). Figure 2: Glycinergic amacrine cells of the mouse retina. A vertical section was double immunolabeled for glycine (red) and the glycine transporter GlyT1 (green). The arrows indicate an interplexiform process ascending to the OPL (OPL: outer plexiform layer; INL: inner nuclear layer; IPL: inner plexiform layer; GCL; ganglion cell layer) (from Haverkamp and Wässle, 2000). Glycinergic amacrine cells are small-field amacrine cells with principally vertical oriented dendrites, and they comprise more than 10 different morphological types (MacNeil and Masland, 1998; Menger et al., 1998). Most of them have small, diffuse dendritic trees and perform local circuit operations between the different sublayers of the IPL. The most prominent and also most numerous glycinergic amacrine cell is the AII amacrine cell which transfers the light signal from rod bipolar cells into the cone pathway (Kolb and Famiglietti, 1974). In the inner IPL, AII cells receive direct glutamatergic input from rod bipolar cells, but they are also engaged with ON-cone bipolar cell axon terminals via electrical synapses (gap junctions). In the outer IPL, AII cell lobular dendrites provide glycinergic, chemical output synapses onto OFF-cone bipolar cell axon terminals and dendrites of OFF ganglion cells. Further glycinergic, small-field amacrine cells were identified in the cat retina by combined Golgi-staining and glycine uptake (Pourcho and Goebel, 1985), and Menger et al. (1998) identified at least 8 different glycinergic amacrine cells in the rat retina (Figure 3). Figure 3: Glycinergic amacrine cells of the rat retina (Menger et al., 1998). Recently it became possible to study glycinergic amacrine cells in the retina of transgenic mice which express green fluorescent protein (GFP) under the control of the Thy1 promotor (Thy1-GFP-O; Feng et al., 2000; Heinze et al., 2007). Three such cells are illustrated in Figure 4, with double labeling for calcium binding protein 5 (CaBP5) in order to reveal the different sublaminas of the IPL and possible bipolar cell candidates as synaptic partners. The cells in Figures 4A and B have small, diffuse dendritic trees; the cell in Figure 4C has a bistratified appearance and has been identified as A8 cell in cats and human retinas (Kolb et al., 1981; Kolb et al., 1992; Kolb and Nelson, 1996) (see also chapter on Roles of amacrine cells, Webvision). Figure 4: Glycinergic amacrine cells expressing GFP in the Thy1-GFP-O mouse. Sections are double labeled for bipolar cell marker CaBP5 (red). CaBP5 is expressed in rod bipolar cells (RB), in type 5 ON-cone bipolar cells (b5), and in type 3 OFF-cone bipolar cells (b3) (Ghosh et al., 2004). A2 and A4 amacrine cells are classified according to the scheme of Menger et al., 1998; A8 according to Kolb et al., 1981. Scale bar: 25 µm. The diversity of types of glycinergic amacrine cells is paralleled by the striking heterogeneity of glycine receptors. All four α subunits of the GlyR have been localized to specific synapses within the mammalian retina (Sassoè-Pognetto et al., 1994; Haverkamp et al., 2003, 2004; Jusuf et al., 2005; Heinze et al., 2007). When subunit selective antibodies were applied to lightly fixed tissue, they each produced a distinct punctate immunofluorescence pattern (Figure 5). The GlyRα1 subunit is expressed in a sparse population of puncta in the OPL, which represent synapses between glycinergic interplexiform cells and bipolar cell dendrites (Figure 5A). In the outer IPL (stratum S1 and S2) GlyR α1 immunoreactivity is found in large puncta, which occur at high density. They represent synapses between AII amacrine cells and OFF-cone bipolar cells (Sassoè-Pognetto et al., 1994). In the inner IPL (stratum S3-S5) smaller GlyRα1 immunoreactive puncta can be observed representing synapses onto ganglion cell dendrites and rod bipolar cell axons (Ivanova et al., 2006; Majumdar et al., 2007a). The GlyRα2 subunit is more uniformly distributed across all strata (Figure 5B), and GlyRα2 immunoreactive puncta occur at the highest density amongst the four α subunits (Haverkamp et al., 2004). The GlyRα3 subunit (Figure 5C) shows four bands whose density of puncta successively declines towards the ON sublamina (Haverkamp et al., 2003). Lastly, the GlyRα4 subunit (Figure 5D) shows a band of high density of puncta at the border between stratum 3 and 4 and further small and sparsely distributed puncta throughout the remaining strata (Heinze et al., 2007). Taken together, the characteristic distribution of subunits across the IPL suggests that the GlyR subtypes are expressed at different synapses and are involved with different neuronal circuits. Figure 5: Diversity of GlyR subtypes in the mouse retina (Heinze et al., 2007). A) GlyRα1 immunoreactive puncta are most prominent in the outer IPL (OFF sublamina). B) GlyRα2 immunofluorescence is more evenly distributed across the IPL. C) GlyRα3 expression is found in four bands. D) GlyRα4 is most prominent in a small band at sublamina 3/4 border. Scale bar: 50 µm. Electron microscopy confirms the notion that the immunofluorescent puncta represent clusters of GlyRs at postsynaptic sites. Antibodies against the α1 subunit recognize extracellular epitopes of the receptor. Thus, staining from preembedding immunoelectron-microscopic experiments appears in the synaptic cleft of the synapse (Figure 6A; Sassoè-Pognetto et al., 1994). Accordingly, postembedding immunoelectron microscopy showed that the α3 subunit was localized at the postsynaptic membrane (Figure 6B). Figure 6: Synaptic localization of two GlyR subunits at conventional synapses in the IPL. A) Preembedding electron microscopy on vibratome sections of rat retina. The figure shows an amacrine cell synapse (AC, arrow) with GlyRα1 immunoreactivity (Sassoè-Pognetto et al., 1994). B) Postembedding electron microscopy of GlyRα3 on ultrathin sections of mouse retina. The GlyR subunit is localized at the postsynaptic membrane of an amacrine cell synapse (provided by Christian Puller, unpublished data). Since synaptic GlyRs are composed of 2α and 3β subunits (Grudzinska et al., 2005) there is the possibility that two different α subunits co-exist in a single heteromeric GlyR. In addition, it is possible that two different GlyR subtypes, such as α2β and α3β GlyRs co-distribute at the same postsynaptic sites. In both cases, the immunoreactive hot spots should coincide. However, when retinal sections were double labeled for the GlyRα1 subunit and the other three GlyRα subunits, no statistically significant coincidence rate of immunoreactive puncta was observed. When retinal sections were double labeled for the GlyRα2 and α3 subunits a coincidence rate of 26.7% was found (Haverkamp et al., 2004). In retinal sections double labeled for the GlyRα3 and α4 subunits no significant coincidence rate was found (Heinze et al., 2007). In sections double labeled for the GlyRα4 and α2 subunits, 31.5% of the α4 immunoreactive clusters also contained the α2 subunit (Figure 7). The results indicate that postsynaptic GlyR clusters usually contain only one type of α subunit. The exception is approximately one third of synapses immunoreactive for GlyR α2 which can also contain the α3 or the α4 subunits. Figure 7: Colocalization of GlyR subunits at postsynaptic sites. GlyRα3 and GlyRα1 immunoreactive puncta are not colocalized whereas GlyRα2 and GlyRα4 immunoreactive puncta sometimes colocalize (from Haverkamp et al., 2003, Heinze et al., 2007). 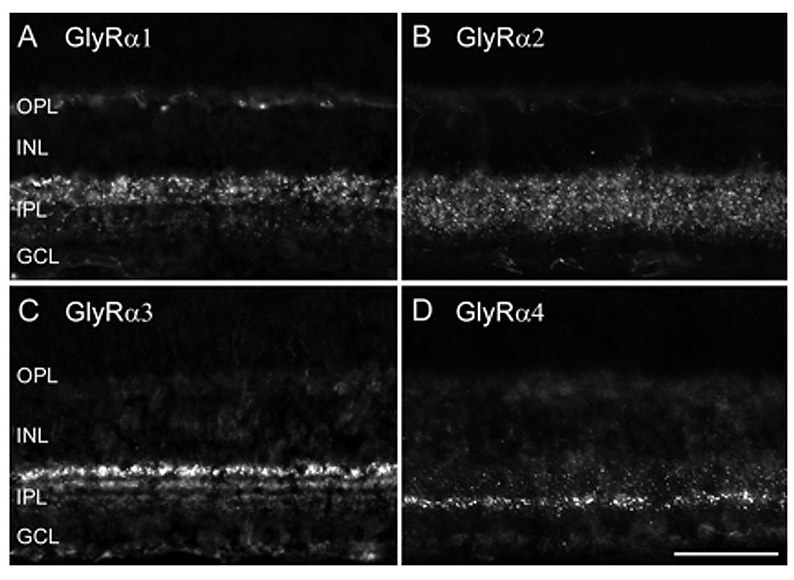 In order to reveal the involvement of selected GlyR subtypes with different retinal circuits, identified neurons were immunostained for the different GlyR α subunits. Figure 8 shows a GFP labeled A-type ganglion cell in a whole mount of Thy1-GFP-O mouse retina (Majumdar et al., 2007a). The retina was immunolabeled for the GlyRα1 subunit demonstrating that many GlyRα1 immunoreactive puncta decorate the dendrites of this A-type ON ganglion cell. A coincidence of puncta and dendrites was also obvious for A-type OFF ganglion cells, which suggests that both ON and OFF A-typet ganglion cells receive glycinergic input through α1 subunit expressing synapses. A-type ganglion cells were also double labeled for the other α subunits but quantification showed that the predominant input is through GlyRα1 containing synapses (Majumdar et al., 2007a). Figure 8: Colocalization of GlyRα1 with the dendrites of an A-type ganglion cell. The image on the left shows an A2-ON ganglion cell in the Thy1-GFP-O mouse (Feng et al., 2000). The whole mount was also immunostained for GlyRα1 and many immunoreactive puncta decorate the dendrites of this ganglion cell. Scale bar: 20 µm (from Majumdar et al., 2007a). Figure 9 shows a vertical view of a Type 3 glycinergic amacrine cell in the Thy1-GFP-O mouse retina (Wässle et al., 2009). Many GlyRα2 immunoreactive puncta (red) coincide with dendritic varicosities of the Type 3 cell (green) (Figure 9D-F). Since this cell is a glycinergic amacrine cell, the puncta may represent input synapses the cell receives from other glycinergic amacrine cells or output synapses the cell makes onto other, non-labeled neurons. 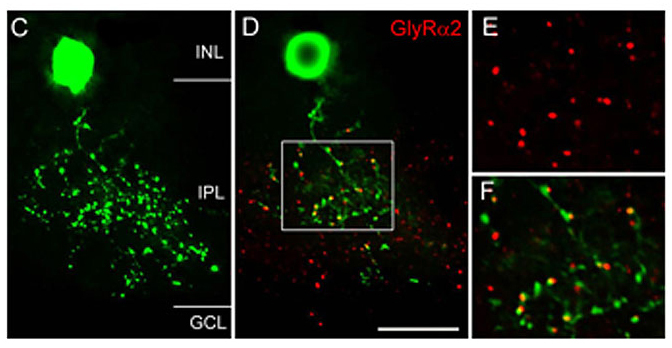 The fact that the red GlyRα2 immunoreactive puncta are always slightly displaced from the green varicosities (Figure 9F) indicates that these synaptic GlyRα2 clusters are expressed by unknown neurons that are postsynaptic to this Type 3 cell. Figure 9: Association of GlyRα2 with a glycinergic amacrine cell. C) Type 3 amacrine cell from the Thy1-GFP-O mouse retina. D) Single confocal section of the cell in C also immunostained for GlyRα2. The boxed area is shown at higher magnification in E and F. Scale bar: 17 µm in C & D, 10 µm in E & F (from Wässle et al., 2009). The two examples of cells presented in Figure 8 and Figure 9 suggest a correlation between the morphological type of a given neuron and the molecular signature of the glycinergic synapse it receives or forms onto postsynaptic neurons. In this context one interesting question is whether the presynaptic neuron instructs the postsynaptic cell to express certain GlyR subunits or whether a given postsynaptic neuron expresses an exclusive GlyR subtype. To address this question a detailed physiological characterization of selected synaptic GlyRs on individual cells is essential. Patch-clamp recordings performed from identified bipolar cells in slices of the mouse retina (Ivanova et al., 2006) enabled the study of GlyRs by the application of exogenous glycine and by recording glycinergic spontaneous inhibitory postsynaptic currents (sIPSCs). Glycine application elicited large-amplitude currents in all OFF-cone and rod bipolar cells while ON-cone bipolar cells exhibited only very small, if any, glycinergic currents (Figure 10, Ivanova et al., 2006; see also Eggers and Lukasiewicz, 2006). 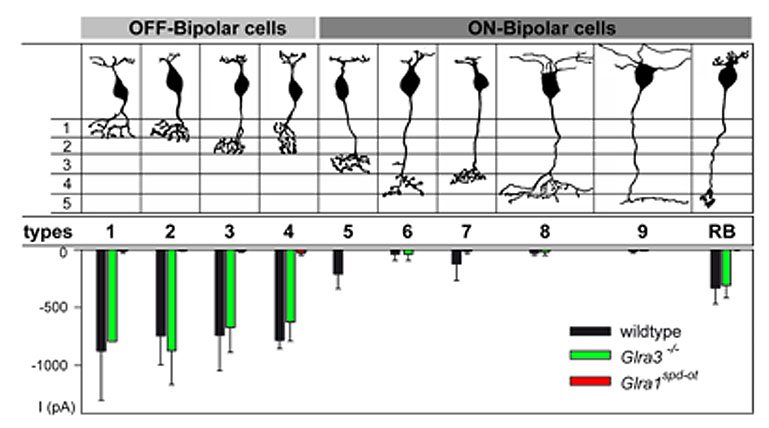 By comparing sIPSCs of bipolar cells in wild-type and Glra3-/- mice, no statistically significant differences were found; whereas glycine-induced currents and sIPSCs were absent from all bipolar cells of Glra1spd-otmice. Thus, OFF-cone and rod bipolar cells receive kinetically fast glycinergic inputs, preferentially mediated by GlyRs composed of α1 and β subunits (decay time constant τ ~ 5 ms). Slow sIPSCs, the characteristic of GlyRs containing the α2 subunit, were not observed in bipolar cells. Figure 10: Glycine-induced currents from mouse bipolar cells. OFF- and ON-bipolar cells of the mouse retina as described by Ghosh et al., 2004 and summary diagram of the peak amplitudes of inward currents elicited by the application of glycine (1–2 mM) in the nine cone bipolar cell types and rod bipolar (RB) cells of wild-type, Glra3– ⁄ – and Glra1spd-ot mice (from Ivanova et al., 2006). Amacrine cells are known to express strychnine-sensitive glycine receptors. The GlyRs expressed by AII amacrine cells and by the narrow-field (NF) amacrine cells Types 5/6 and Type 7 were studied by patch-clamp recordings in mouse retinal slices (Figure 11) (Weiss et al., 2009). Glycinergic sIPSCs of AII cells displayed medium fast kinetics (τ~ 11 ms) (Figure 11), which were completely absent in the Glra3-/- mouse (Figure 12), indicating that synaptic GlyRs of AII cells mainly contain the α3 subunit. Glycinergic sIPSCs of NF cells had slow kinetics (τ~ 27 ms) that were significantly prolonged in Glr2-/- mice (τ~ 69 ms) (Figure 12). These data show that morphologically distinct amacrine cells express different sets of glycine receptors. Figure 11: Glycinergic sIPSCs of mouse narrow-field amacrine cells. A) Examples of recorded AII, and narrow field (NF) amacrine cells. B) Frequency histogram of decay time constants of glycinergic sIPSCs recorded from AII cells and from NF cells in wild-type mice. Figure 12: Glycinergic sIPSCs of mouse narrow-field amacrine cells. C-F) Decay time constants of glycinergic sIPSCs recorded from NF cells of wild-type, Glraspd-ot, Glra3-/- and Glra2-/- mice (from Weiss et al., 2009). Glycine induced currents and sIPSCs were also recorded from displaced wide-field, putative GABAergic amacrine cells. 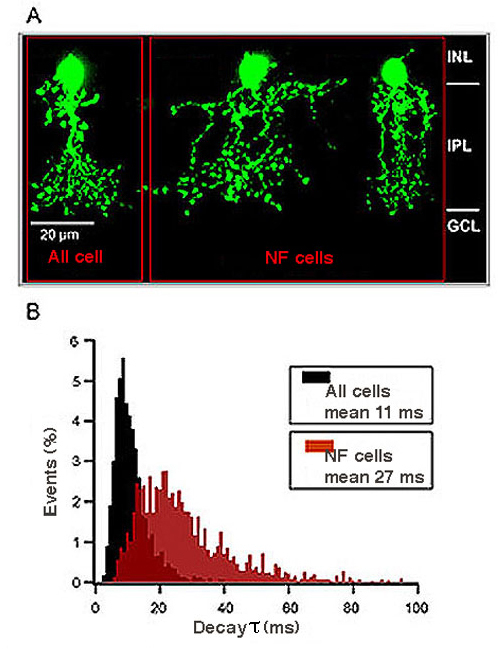 These GlyRs had slow kinetics (τ ~ 25 ms; Veruki et al., 2007; Majumdar et al., 2009) comparable to NF amacrine cells. ON-starburst (cholinergic amacrine cells) had sIPSCs with extremely long decay time constants (τ ~ 50 – 70 ms), which did not differ between wild-type and the three mutant mice (Majumdar et al., 2009). Since GlyR α4 immunoreactive puncta (Figure 6D) occur at higher density along the dendrites of ON-starburst amacrine cells, it is possible that GlyRs of ON-starburst cells are dominated by the α4 subunit. 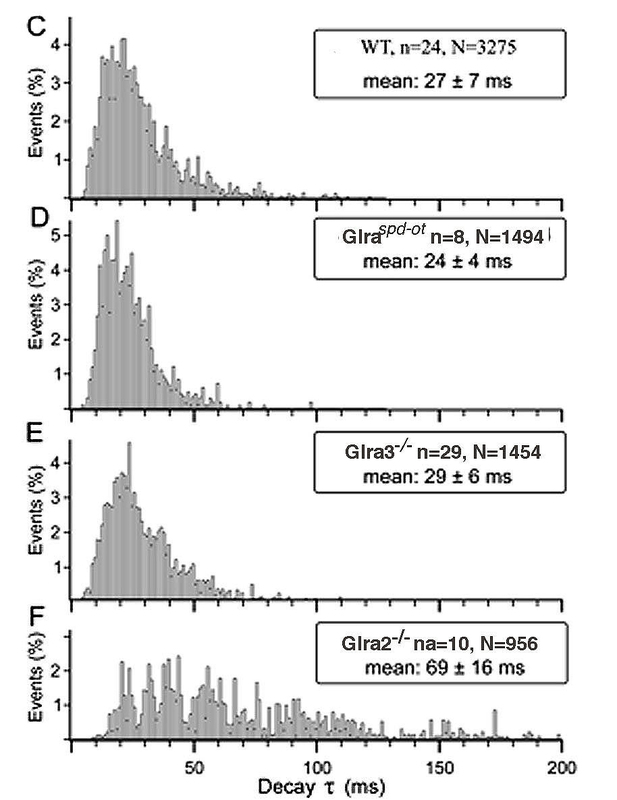 This would in turn suggest that GlyRs containing the α4 subunit have slow kinetics. There are more than ten different types of ganglion cells in any mammalian retina. The GlyRs expressed by A-type ganglion cells (alpha-cell homologues) of the mouse retina were also investigated both in wild-type and mutant mice (Majumdar et al., 2007a). In the wild-type retina, glycinergic sIPSCs of A-type ganglion cells have fast kinetics (mean τ = 3.9 ± 2.5 ms). Glycinergic sIPSCs recorded from Glra2-/- and Glra3-/- mice did not differ from those of wild-type mice. However, the number of glycinergic sIPSCs was significantly reduced in Glra1spd-ot mice and the remaining sIPSCs had slower kinetics. These results show that A-type ganglion cells receive preferentially kinetically fast glycinergic inputs, mediated by GlyRs containing the α1 subunit. B-type cells (beta-cell homologues) are probably involved with sustainedneurotransmission. They are also believed to perform complextasks like local edge detection. However, the specific rolesof different B-type cells in the mouse retina are not yet clearlyunderstood. There are four classes of small-field B-type ganglion cells (Sun et al., 2002), and there seems to be a substantial heterogeneitywith respect to GlyR expression in these cell types. GlyRs of B1 cells are dominatedby the α1 subunit, while in B4 cells the α3 subunit plays an importantrole. B2 and B3 cells express a more balanced mixture of fast(α1) and slow (α2, α3, α4) GlyR subunits (Majumdar et al., 2007b). All four GlyR α subunits are clustered in synaptic hot spots (Figure 6) that show characteristic distributions across the IPL of the mouse retina (Heinze et al., 2007). Gephyrin is responsible for clustering GlyRs to postsynaptic sites by linking the GlyR β subunit to the cytoskeleton (Kirsch et al., 1993; Meyer et al., 1995). No GlyR clusters could be detected in gephyrin deficient mouse retinas (Fischer et al., 2000), which suggests that synaptic GlyRs in the retina are always heteromeric. In the adult, two copies of the α subunit and three copies of the β subunit form the pentameric receptor protein (Grudzinska et al., 2005). Bipolar cells and A-type ganglion cells represent the fast transfer channel of the mammalian retina and, therefore, express α1β GlyRs with fast kinetics. AII amacrine cells relay rod light signals with lower temporal resolution and express α3β GlyRs with medium-fast kinetics. NF amacrine cells are modulatory interneurons, where temporal precision seems less important and they express the α2β and α4β GlyRs with slow kinetics. Both GABA and glycine inhibition are used to modulate different aspects of ganglion cell responses and receptive field (RF) organization (Caldwell and Daw, 1978; O’Brien et al., 2003; Chen et al., 2010). GABAergic amacrine cells often provide feedforward inhibition and target both GABAARs and GABACRs in reciprocal inhibitory circuits to modulate the RF center excitation (Eggers and Lukasiewicz, 2011), and they target GABAARs to amplify and refine the RF surround (Flores-Herr et al., 2001). Glycinergic inhibition on the other hand modulates less spatial than temporal properties and may increase the gain of the ganglion cell response. Glycinergic amacrine cells often use (crossover) inhibition to modulate ganglion cell excitatory inputs within their RF center (Wässle et al., 1986; Hsueh et al., 2008; Manookin et al., 2008; van Wyk et al., 2009; Werblin, 2010). Majumdar, S., Heinze, L., Wassle, H. (2007) Glycinergic Synaptic Inputs of B-type Ganglion Cells of the Mouse Retina. Invest Ophthalmol Vis Sci, 48, E-Abstract 4597. Majumdar, S., Weiss, J., and Wassle, H. (2009). Glycinergic input of wide-field, displaced amacrine cells of the mouse retina. J. Physiol. 587, 3831-3849. Pow, D.V., and Hendrickson, A. (1999). Distribution of the glycine transporter GlyT-1 in mammalian and non-mammalian retinae. Vis Neurosci 16, 231-239. Silke Haverkamp received her PhD from the Carl von Ossietzky Universität Oldenburg, Germany, in Visual Neuroscience under the mentorship of Josef Ammermüller. She was a postdoctoral researcher at the Boston University with Bill Eldred and then at the Moran Eye Center in Salt Lake City with Helga Kolb. 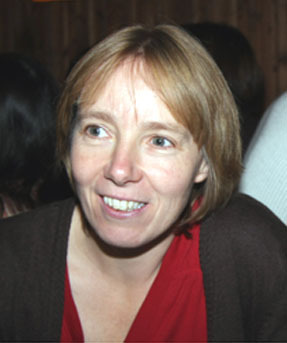 Afterwards, Silke moved back to Germany to join the Department of Neuroanatomy headed by Heinz Wässle at the Max Planck Institute of Brain Research in Frankfurt. She has now her own research group at the Institute and focuses on the structure and function of neurons and synaptic circuits within the mammalian retina, using neuroanatomical and electrophysiological methods.